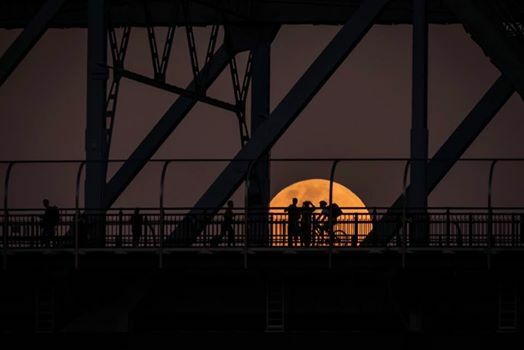 Jennifer Dudley-Nicholson captured this amazing photo of the supermoon behind the Story Bridge in Brisbane. IF you've always wanted to capture a super shot of the moon, tonight and tomorrow night could be your best opportunities in almost 70 years. But let's be honest, you won't get the best photo using a smartphone - even the best of them. Monday and Tuesday night's supermoon will be best captured using a proper camera - a DSLR or at least a good quality compact with a great zoom - and a tripod. The supermoon will appear about 15% larger and will be the closest full moon in 68 years. Australasian Science magazine writer David Reneke says practising with aperture settings on your camera is important. He recommends using two or three different settings with exposure times of quarter, half and one second. Obviously the bigger the lens you have the better. But remember, the longer the lens the more potential you have for blur so that's where a tripod is pretty vital. Aperture: f/8 or wider, like f/5 or f/5.6, depending on the amount of light available (less light). Shutter speed: between 1/200 and 1/8. ISO: Start with the camera's base ISO (typically ISO 100 or 200 depending on the camera) and I push the ISO up depending on the light conditions. NASA photographer for more than 25 years Bill Ingalls has shared some great tips for taking a photo you will want to show your grandkids. He recommends making sure you have a landmark - such as a building in the foreground. That provides a sense of place and makes the moon look larger. He also suggests spending some time to work out exactly when and where might be the best local vantage point, where the moon is most likely to pop up on the horizon, while trying to keep away as much as possible from city lights. Moonrise tonight in Sydney is 7:07pm AEDT and Brisbane 5:51pm AEST. Check your weather page for local times. It's also worth having some fun. For example, you could have one of your kids appear to be holding the moon in their hands - if you can get them to stand still for long enough - by shooting at the right angle. Bill Ingalls also recommends using daylight white balance as the best setting to capture the moonlight, as the moon is reflecting the sun's light. If you are shooting the moon on a smart phone, you can adjust your settings in many of the best cameras. Try to use a car or something as a tripod if you don't have one. Make sure you also 'lock in' the focus and aperture setting for the moon by holding down on your screen where the moon is for a few seconds. After you have taken your photo, you can adjust the light settings to increase the contrast. It's also worth trying to put a building or local landmark in the shot to give it some context.